The Slovak metal band GALADRIEL was founded in July 1995 by vocalist and bass player Dodo Datel, guitarist Voloda Zadrapa and drummer Dr. Victor Gieci. The musical direction of this band was doom metal, which was a very strong style in the middle 90's. The early beginnings were signed by looking for the right people to complete the line-up so there were often member changes. In the beginning of Summer of 1996 female vocalist Sona Witch Kozakova entered the band. In this 4-member line-up GALADRIEL recorded their first promo CD in August 1996. The keyboards were recorded by friendly King (member of Lunatic Gods in those years). In autumnal days rhythm guitarist Chulo Malachovsky entered the band. With his help the band wrote the next three songs and recorded them in January 1997. At that time Unknown Territory (a new small independent British label) offered a contract for the debut album. So, both recordings were completed and finally released in September 1997 as a CD, "Empire Of Emptiness". But in the summer of 1997 the band overcame the change on the post of lead guitarist. Voloda Zadrapa left the band and young guitar talent Tomax Gabris took his place. GALADRIEL also found their first keyboard player Erik Schmer. In this line-up the band prepeared their new material and it was recorded in November of 1997. Two more songs were recorded in the spring of 1998 (already without keyboardist Erik Schmer). All these songs were released in January 1999 as a second CD, "The Mirror Of Ages" by the same label, Unknown Territory. The following years were signed by other changes in the band. Sona’s brother J.S.K. became a keyboard player and guitarist Gabriel Holenka replaced Chulo Malachovsky. In 1999 GALADRIEL wrote and recorded all songs for their third CD "Oblivion" that was released in March 2000. The recording process was really complicated and the band was never satisfied enough with this record. Anyway, it was the last record by Unknown Territory. In spring of 2001 GALADRIEL recorded a cover version of Blind Guardian's song "Bard's Song - The Hobbit" for the tribute compilation "Tales from the Underground" (already without guitarist Gabriel Holenka). The atmosphere in the band was not very good at that time, but the result of this song helped to put members together again. 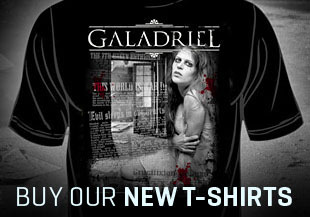 New songs were finished very soon and a few months later GALADRIEL recorded their fourth CD "From Ashes & Dust". We can say that this record was a turning point for the band. The sound and arrangements of this record were much better than before. With this record GALADRIEL soon signed the contract with Metal Age Productions (Slovak label) which released this album in 2002. In the end of 2002 rhythm guitarist Matus Hanus entered the band. But in the beginning of 2003 the still old pesonal problems surfaced again and the band was near the tragical extinction. Three old-year members left the band (Sona Witch Kozakova, J.S.K. and Dr. Victor). After this hurricane the band (Dodo Datel, Tomax Gabris and Matus Hanus) prepeared new songs and in autumnal days of 2003 recorded their next album with many guest musicians. This CD was called "World Under World" and was released in March of 2004 by Metal Age Productions again. The band played many gigs with guest musicians but in September of 2004, after 20 months of chaotic existence, lead guitarist Tomax Gabris left the band. In 2006 the band wrote new songs for a new album. At the begining of 2007 drummer Hoyas left the band. Soon, the band entered the studio to record new album "Renascence Of Ancient Spirit" with two guest drummers (Dr. Victor Gieci - former band member and Jan Valer Tornad). In the recording process keyboardist J.S.K. left the band so Matus Hanus recorded most keyboard parts on the record. New album "Renascence Of Ancient Spirit" was released by Metal Age Productions in June 2007. In the begining of 2008 Andrej Kutis entered the band as new keyboardist. The band played many gigs with pre-recorded drums and in February 2009 Adam Zelenay finaly became a drummer of GALADRIEL. At the end of Summer the problems with guitarist Skkipi Skuppin culminated to end of the co-operation between him and the band. This was the perfect time to comeback of Tomax Gabris after five years. Right after this change the band started to write new songs for next album. But as always things were not going to be so easy. After other personal complications the band entered the studio in March 2012. The new album “The 7th Queen Enthroned“ was released by Gothoom Productions in November 2012 and drummer Matej Ferianc and guitarist Michal Kolejak became band members in 2013.